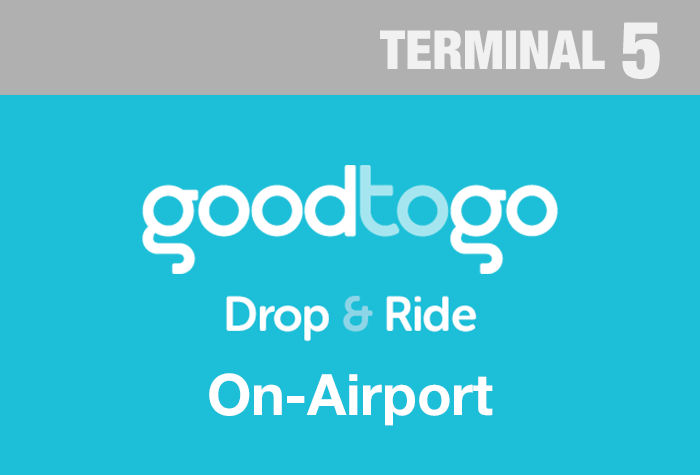 Good to Go Drop and Ride T5 car park at Heathrow Airport is the epitome of convenience on a budget. Despite being the cheapest option of all our Heathrow Airport Car Parks, it's still only 6 minutes from the terminal. What's more, you won't even need to spend time hunting for a space - the car parks fully insured drivers do all of that for you - all you need to worry about is catching your flight! Use the handy route-finder on our Map & Directions page for straightforward instructions to the car park. Check in at the reception where one of our professional drivers will be waiting to get your parking sorted - you just need to hop on the transfer bus which runs when you need it. While you're away, rest easy knowing that your car is secured by fencing, CCTV and regular patrols. On your return, just ring the number you were given at check-in and the bus will arrive promptly to take you back to reception where your car will be waiting - it really is that simple. It's always advisable to pre-book your parking, and doing so through Holiday Extras can save you up to 70% off the car park's gate rate prices. The earlier you book the higher the savings, so it's best to make your reservation as soon as you can - then you can relax and anticipate your holiday in the knowledge your parking is sorted. Great value parking - just 6 minutes from Terminal 5. Not only is Good To Go close to the terminal, it's a fuss-free car park designed to make parking simple. After all, you want a low-key start before you head off on your holiday! When you get to the car park, you won't even need to find your own parking space. Simply pull up outside the reception, hand over your keys and let one of the professional drivers worry about the parking. It takes just seconds to check in, so you can get straight to the airport. In fact, the transfer bus is ready to leave as soon as you are, so there's no waiting around. You'll be whisked off to the terminal in just 6 minutes. While you're away, your car will be looked after in Good To Go's secured car park with CCTV and patrols to give you peace of mind. When you get back in the UK, all you'll need to do is collect your luggage, call the car park and catch the bus back. Once you've got back to the car park, head to reception, pick up your keys and your car will be waiting for you outside. Just hop in and drive home! If you're after a super-speedy, convenient service then book Good To Go Drop and Go today and get the best price available. Accessibility - If you have mobility issues, please call us once you've booked and we'll arrange suitable transport to get you to the terminal. Transfers between 22:30 and 05:00 run when needed only, so if you need to get from the airport to the car park between these times, call the car park and the transfer bus will come and get you. The car park is closed for arrivals between 00:00 and 05:00. The transfer bus is ready to leave as soon as you are. It takes about 6 minutes to get to Terminal 5 and is included in the price. When you're back, give the car park a call on the number they'll give you at check-in, and the bus will pick you up from outside the terminal. Our customers rated Good To Go Drop And Ride on average 9/10 (218 reviews). Read Good To Go Drop And Ride reviews.